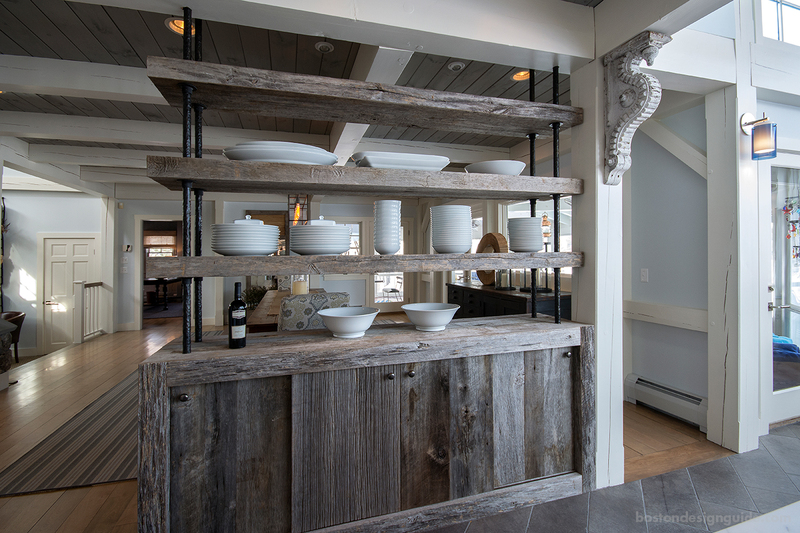 A client with Floridian sensibilities approached general contracting firm Wood & Clay, Inc. to give their post and beam a whole-house renovation that would lighten up their Lakes Region home. 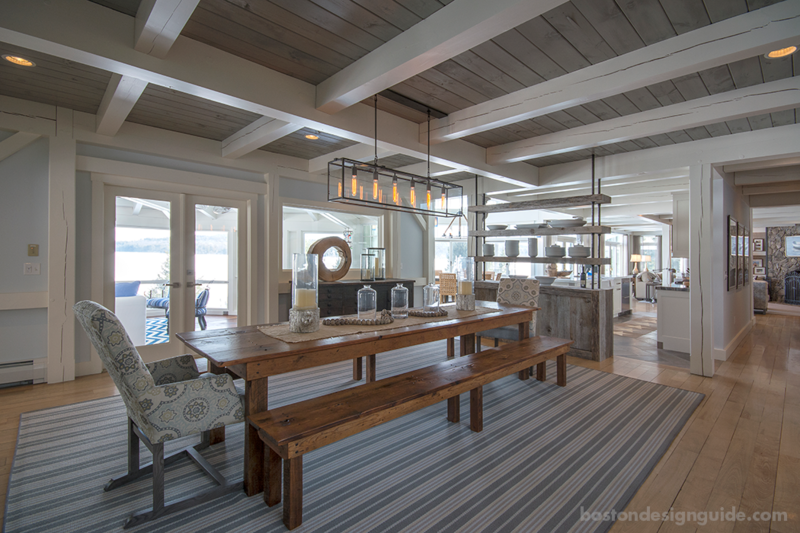 While the client wanted a sunshine state for their Northern home and a “beachier” vibe, the dwelling’s new look is still a product of its New Hampshire setting. Along with white clapboard and gray tones to satisfy the client’s wishes, the home is teeming with thoughtful custom details—like poplar barn doors and reclaimed wood elements—that make it very much at home in its woodland site. 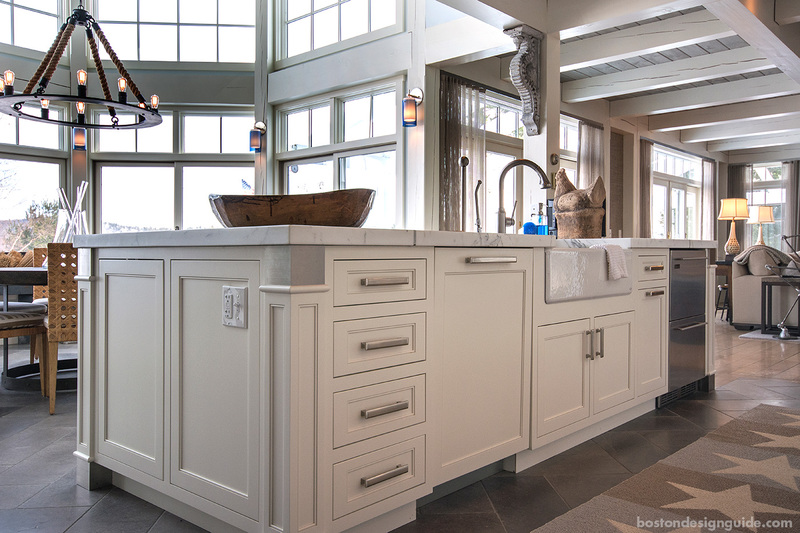 Wood & Clay, Inc. typically works from the ground up, explains owner and president Kevin Beland; the family-run general contractor doesn’t do a tremendous amount of renovations. Still, this redo was particularly satisfying for Beland, in large part because of the cohesion and aesthetic that flows from room to room. Wood & Clay worked closely with interior designer Jeff Strasser of the international firm Marc-Michaels Interior Design to achieve just the right look. 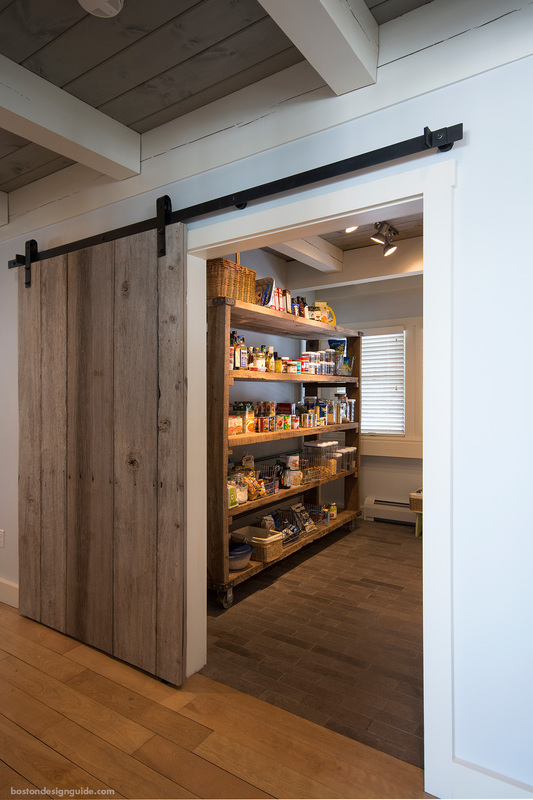 First-floor standouts include an open, silver-toned salvaged wood shelf and cabinet that divides the kitchen from the dining area and its reclaimed barn board companion that slides to conceal the pantry. Both are made of thick, reclaimed poplar, because it “furs when it wears,” and won’t splinter, with cut nails used to resemble a barn. 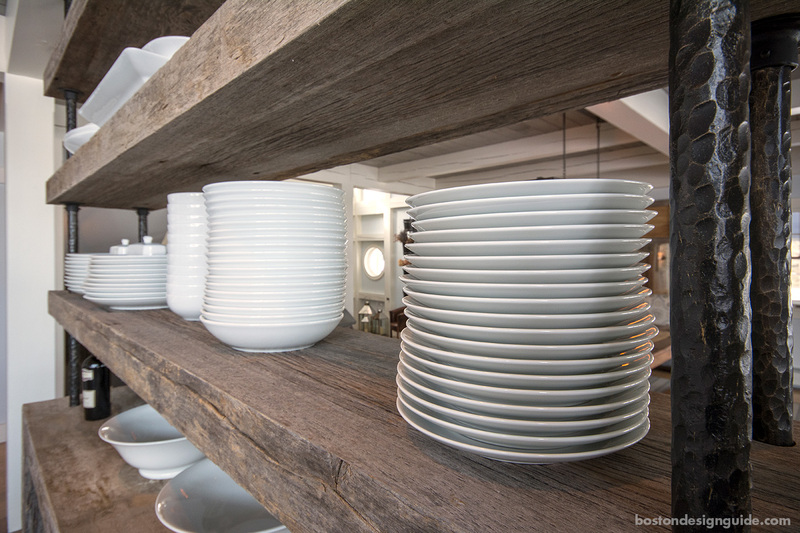 Beland went to the source—Cambridge’s Longleaf Lumber—to inspect the furrow and feel of the reclaimed boards that would lend the space an air of rustic sophistication. 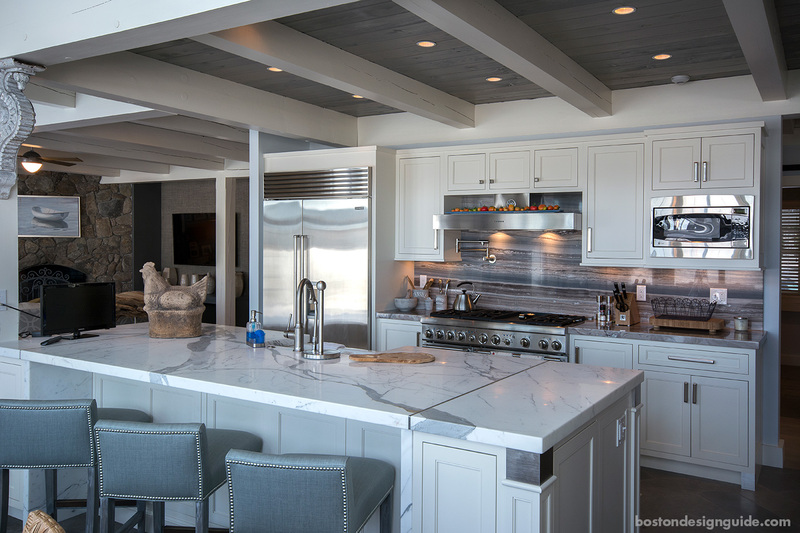 A design setback became a plus when conceiving a gleaming Calacatta marble kitchen island. 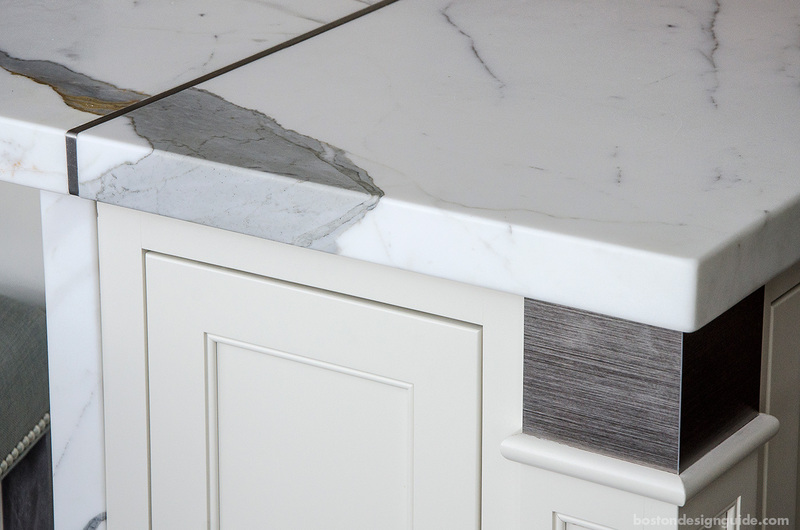 Together with Pinnacle Kitchens, Wood & Clay embraced the seams of the choice slab, incorporating a brushed stainless metal seam at either end of the surface. The metal detail is in tune with the brushed stainless squares inset alongside the island’s picture frame molding, and brilliant astride the kitchen’s exposed hood and showstopping blue azul granite backsplash. 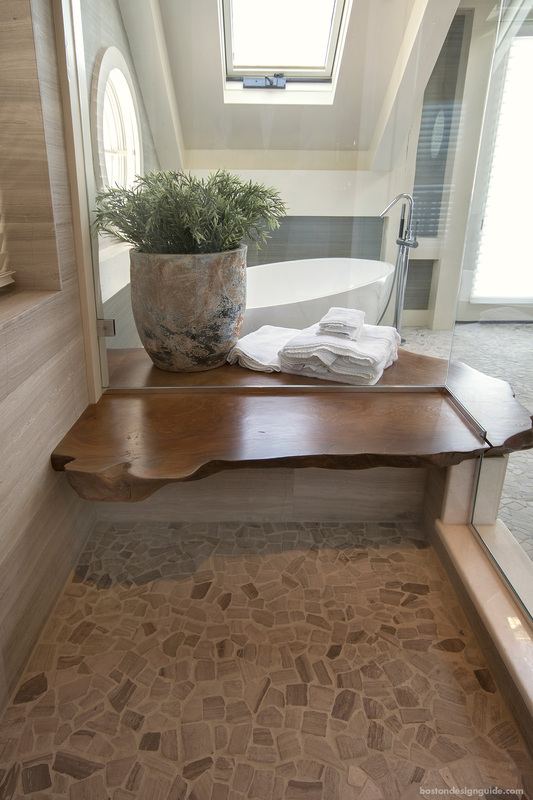 To achieve an organic feel in the master bath, Beland knew he wanted to somehow incorporate a redwood stump as a shower seat and design feature. 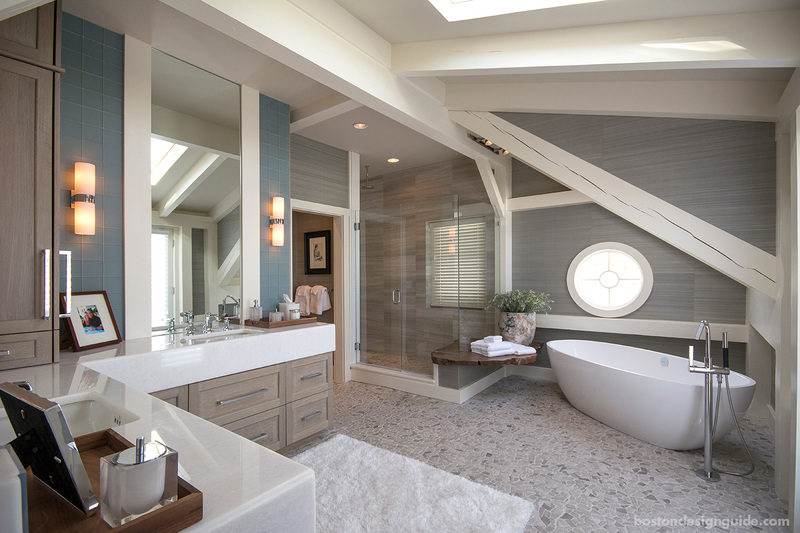 Poised between the shower and freestanding tub, the slice of redwood, which was stained and treated with multiple marine coats of varnish, makes a natural statement amid the oasis' glass tile, fields of granite, and pebble flooring. He and Strasser wanted the bench to be the room's focal point, and appear to be “precariously" perched. Construction by Wood & Clay, Inc.; interior design by Marc-Michaels Interior Design; kitchen design by Pinnacle Kitchens; reclaimed lumber by Longleaf Lumber; tile and granite by Perillo Marble Tile and Granite; photos courtesy of Wood & Clay, Inc.